Complete 2300 Watt Metal Halide Printing Lamp Assembly. Shorter exposures, pollution free and longer bulb life with no fall off! This lamp is the ideal light source for screen type emulsions. Exclusive glass down design. Simply load, close and expose. No limit to height of screen because of special DOUTHITT "DEEP DRAW" BLACK Blanket. Under vacuum this blanket swiftly molds itself to the shape of the screen frame and holds your positive in perfect contact. The Blanket is secured to structural steel tubing and the blanket frame is raised and lowered by exclusive sliding toggle. Vacuum automatically cancels after exposure. 5000 Watt Metal Halide Printing Lamp Assembly instead of standard lamp. Douthitt Heavy Duty Model 26 Silent Air Pump instead of standard pump & motor (this pump requires compressed air).For Details. 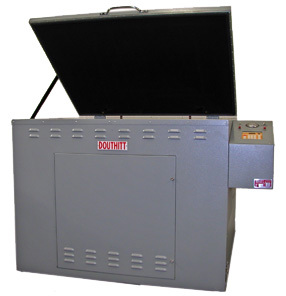 Douthitt Heavy Duty Model MAGIC 83 Combination Light Integrator and Digital Timer in lieu of Timer. Integrator comes complete with vacuum time delay for one button automation.For Details.